company’s brand strategy? The United Nations Industrial Development Organization defines corporate social responsibility as, “a management concept whereby companies integrate social and environmental concerns in their business operations and interactions with their stakeholders.” Basically, companies are trying to make the world a better place, while focusing on their bottom lines. One benefit of integrating CSR into your company is the positive publicity you can generate. Local media outlets will enjoy hearing how your business is benefiting the community through your generous charity work or donations. This positive press coverage can boost your sales and ultimately improve your bottom line. Another reason to invest in corporate social responsibility is its impact on your employees. You will be able to attract and retain better talent with a strong CSR program. Employees will be happier knowing that they are making a difference in the world by working for you. Happy employees are productive employees, so again CSR benefits your bottom line. Customer loyalty is another reason to implement corporate social responsibility. A Neilson survey found that 53 percent of participants make purchasing decisions based on a company’s commitment to the community. Millennials, in particular, are motivated to buy from socially responsible companies. As their generation becomes more and more influential, appealing to that demographic becomes more essential for companies. You can drive customer purchases and build customer loyalty through an effective corporate social responsibility program. There are many companies who practice corporate social responsibility. One such business is Salesforce. They use a 1-1-1 approach to philanthropy. One percent of their company’s equity goes to grants in communities where employees live and work. One percent of their product is donated to nonprofits, and one percent of each employee’s time goes towards volunteering. Ben & Jerry’s is another company dedicated to corporate social responsibility. Since the ice cream giant’s inception, the brand has been dedicated to promoting social causes. The company donates 7.5 percent of its pretax profits to charity. 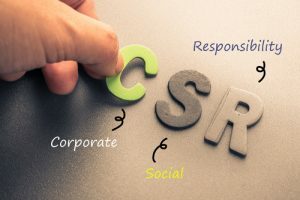 Are you considering building a CSR program? The Borenstein Group, a Top DC marketing agency, can help. Contact us today to start your charitable actions, donations, and projects today.